I look forward to every weekend knowing that I’ll be trying out a new crafty project and I was particularly excited about this one: glass etching. Do you want to have a go too? 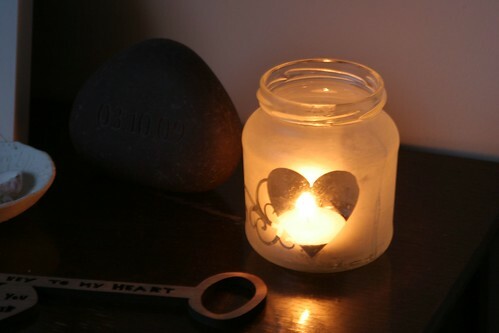 If you do you’ll need etching compound (I got mine here) plus you need an old brush and some gloves as well as something to etch – I decided to use an old jam jar and turn it into a pretty candle – and a way of creating a template. You could cut a design out of contact paper or sticky back plastic but I used vinyl and my Silhouette to cut a fancy heart shape. First you need to stick the design firmly onto the jar. Put on gloves and paint the compound on liberally. Follow the instructions and leave it on for as long as it suggests. Then rinse it off (wearing your gloves still please, it’s acid) and remove the sticky template. Light a tealight and there you have it, a romantic candle. Let me know if you’ve tried glass etching or you if plan to give it a go. Wow, I have don’t glass etching for a very long time. Seeing you design gave me idea to start again. The only thing I ever etch was christmas glass balls and gave them as gifts. Maybe I’ll do it again being that I only have one left as a reminder. Thanks for doing so many different crafts every week keep up the good work. Thank you so much Inez. Christmas baubles are a great idea! Thanks so much for this – I’ve been looking for glass etching stuff and only saw it on American blogs/websites. And Fred Aldous will be at the craft show at the NEC next month so I can see if they have some on offer. One little query though – what is contact paper? You’re welcome Wendy. Contact paper is the US equivalent of sticky back plastic. I found my vinyl worked really well. Oh, sorry, I didn’t realise you’d replied. I don’t usually go back to check comments. But thank you for your response!